I whipped up this tasty appetizer when it was my turn to host our monthly mastermind group. Sweet bliss = intelligent women changing the world + sweet potatoes + cashews. I hope it sparks good karma in your roundtable too! 1. In the morning, place 1/2 cup cashews in filtered water and let soak for 6 hours. This can also be done overnight. 2. Pre-heat oven to 350°. Wrap sweet potatoes in aluminum foil and bake for 45-60 minutes or until tender. Let cool. 3. While sweet potatoes are cooling, drain cashews and rinse clean. Pat dry. Thinly slice the garlic cloves. 4. Peel the cooled sweet potatoes (the skins should fall off), chop them into thirds and place in food processor. Add cashews, lemon juice, sea salt, olive oil, garlic and cayenne. 5. Blend on low into a creamy consistency. Adjust seasoning as needed. 6. Place in a serving bowl and sprinkle with paprika. 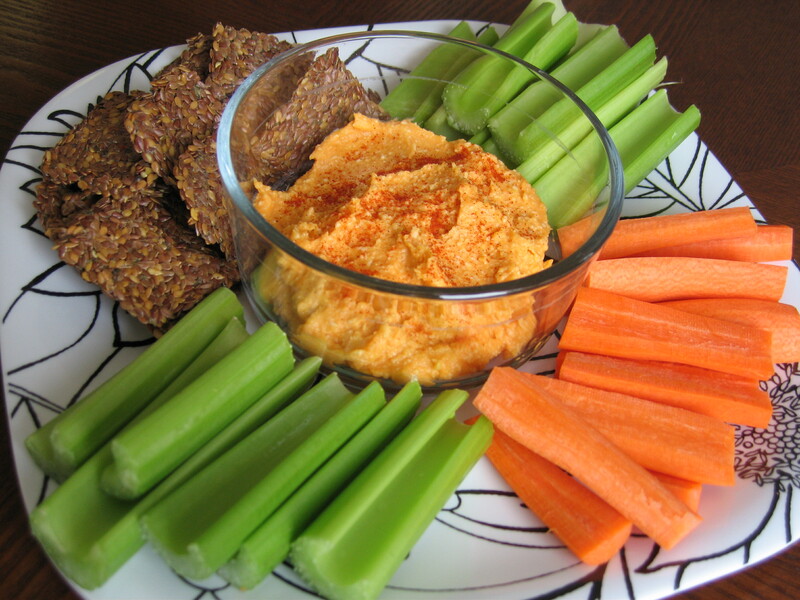 Serve with your favorite vegetables and Flackers (flax seed crackers).